Chen Fei Yu's Thai fan page translated his award accpetance speech intoThai. I have never understand it entirely and now I am impressed with him even more. Dear teachers, friends and colleagues. Good evening! My name is Chen FeiyYu. It is such a great honor for me. is a duty that need to be done. At this moment, I would like to thanks all audiences who are so kind (to me). I grew up in a rather strict family. My dad.... Today, he is still the same. He taught me many things. I always wish to be as good and strong as him. People would say that "I am your dad"
People would say " He(Chen Kaige) is Chen FeiYu 's dad." and to become an admirable actor on the stage." and also can make a living. At the same time, you must understand/interpret each characters and show it to the audience. When you can do that, your dream will come true." I wish to become a good actor. Thank you, @mei2018! He never ceased to impress me. I love his thought process, which is reflected in his speeches, interviews, social media (when he's not advertising, LOL). I'd like to share with you this blog post. It's about the event when CFY slipped tongue depicted by mei above, but with additional assessment of the blogger. Wait, does he/she happen to be here as well? Thx @mei2018 a lot a lot although i never understand his thoroughly speech, but i can feel that his speech is powerful, how the audiences so silent listening to him, a 18 years old kid own the stage in front of hundreds of seniors, and now I know why thx to you. His father also educate him very well. Thanks to you too @epinklyn! Hahaha... I like finding and sharing gem articles/blogs on our beloved Arthur, so it's a great pleasure of mine! Awww thanks also for the GIF! Look at those long eyelashes! Video compilation from Legend of Awakening BTS n Airport. Credit as tagged. CFY is taking admission test on Beijing Film Academy, goodluck! So he didnt go to continue his study in US. Credit to @MsA_kmh on twitter. More stills. Really like his new hair style, really like a college student, so tidy. Remember his dad said about being an actor not because aftering fame, but he cant avoid it yeah? Now the whole world keep an eye of his every single move, like now he just went admission test for college, he is already trending topic on weibo and getting on the news. I am happy and sad for him . Yeah, I'm wary about this too. It's hard to avoid popularity for someone like him. If he doesnt like one, then perhaps he can choose to be a 2nd lead, like what Qiao Zhenyu used to do (then again, wont he be too stand out as one?) . Or he can work in a serious project in the future, instead of young popular ones like what he is currently taking. Well, that needs time. I am happy that he decides to get admission exam in China, so he still can have some projects while studying. He will need to learn and adapt to the fame that comes with his success.I think that he can do it. He is mentally mature than his age. It's hard to avoid popularity for someone like him. If he doesnt like one, then perhaps he can choose to be a 2nd lead, like what Qiao Zhenyu ﻿used to do (then again, wont he be too stand out as one?) . Or he can work in a serious project in the future, instead of young popular ones like what he is currently taking. Well, that needs time. i have to search Qiao ZhenYu in google, so he was specialized in 2nd lead? but like you have said, CFY has the main lead aura, so maybe he can be 2nd lead but because he likes the character in the movie/series and he is the one choose to be it. btw in twitter there is rumour that CFY and LHR will act together on CKG project. I really hoping this is true! actually i prefer he study in US, in there he will have more privacy and can focus on study, something that cant be happened in China. But since so many actors study in Beijing Filming Academy, and they are quite safe, so I feel quite relieve. And since CFY want to be an actor, so he has to study in that specific department, whether in China or US. I read similar thing not only on twitter but also in some C newspage. It doesn't only mention CFY and LHR's names, but also Wen Qi and Zhang Xueying. I think we better wait until more established/reliable news sources raise/confirm it, because it's very common for producers to throw names for buzzes, and in the end other actors are cast. Actually, some people are wondering why a good handsome actor like him often become a 2nd lead. He has the qualification to be a lead, but he is mostly not (although he already has several dramas with him as one). I think studying in Beijing is the best for his current condition, if he is serious in becoming an actor. Meaning, he doesn't take it as a side job. He has a lot of prospect projects, so it's easier to manage his schedules between study and work here. Improving his acting is a way to increase his value. IMHO, unless he is planning to work in a corporation , he can still study again later someday. I'm actually wondering whether he has planned this since he said that he wanted to be an actor. TUITION Program fees range from $1,240 to $1,550 for local students; international students pay $6,665 to $7,905 per year for film programs. Partial and full scholarships are available based on need and merit and are awarded on an individual basis. DEGREES B.A., M.A. and Ph.D. programs in everything from performance and direction to cinematography and animation. All degree programs are conducted in Chinese, though international students may take some courses in English or study Chinese at the Film Academy. 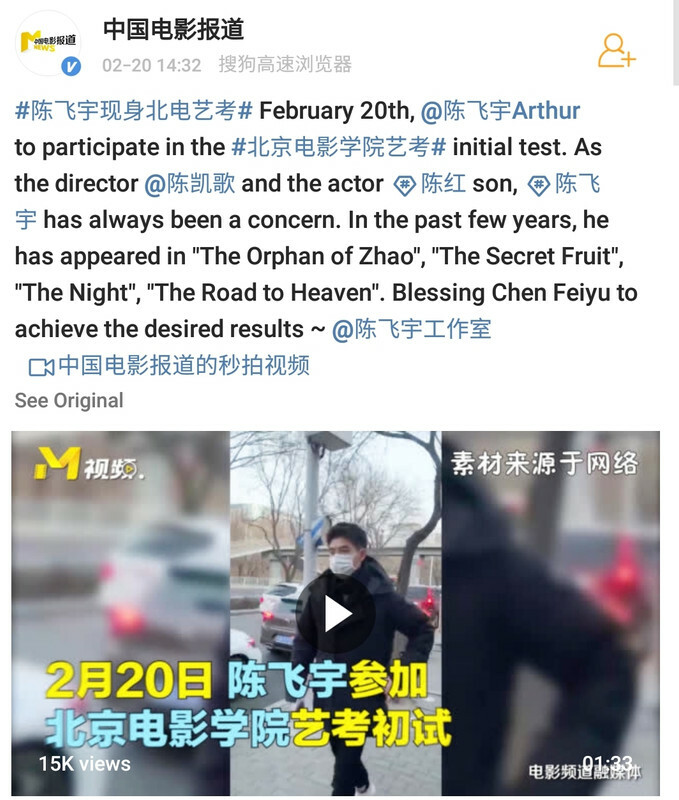 But after reading it, i believe CFY want to follow his Dad foot steps really really serious, since CKG also an alumni of BFA too. So yeah maybe before he reach 16 y.o and being assistant of director, he was still an ordinary kid who pursued non filming education, but now is different LOL. He got the AHA moment in the right time and decided to be an actor. Ah yes i also read those names, hopefully this is true! finger crossed. That means CKG remember LHR really well when he did Legend of Demon Cat back then, and it is a good thing CFY can work with him, and watch him as a mentor. LHR also study at BFA, along with SYR, etc, right? LHR studies at Central Academy. Central Academy, together with BFA and Shanghai Theater Academy are the most prestigious higher education institutions in film in China. For acting department, Central is actually considered the best by most people, they sort of specializes in drama. They tend to produce serious actors, like Chen Baoguo, Ni Dahong, Zhang Ziyi, and in the younger generations names like Wang Kai and Yang Shuo. In short, actors that most likely appear in Daylight Entertainment, LOL (the producer of Nirvana In Fire, Ode to Joy, Ming Lan). BFA excels in film producing, although many of their acting dept alumni also include top stars like Huang Zhaoming, Zhao Wei, and Yang Mi. The reason I'm cautious about those names is because they are currently the most sought after young stars. LHR, Wen Qi and Sophie Zhang are considered serious young actors, not just idols. Wen Qi had won a Golden Horse at the age of 13 or 14. If indeed CFY will work with them in one movie, that will be fantastic! But again, like I said before, many times names are thrown in for marketing purpose. So yeah... like you said, let's cross our fingers! Ah wow i see, thank you for the explanation, so maybe CFY chose BFA because he want more than acting, but also directing, producing and etc. I read on twitter, that CFY only chose BFA for his college, that is why he is so nervous. Hopefully he can be admitted succesfully! I just googled Wen Qi, turns out she is a Taiwanese actor, Vicky Chen, and just like Sophia Zhang, they both are young and talented rising star.